PAUL BELLINGER PHOTOGRAPHY: BILLINGS MONTANA PORTRAIT PHOTOGRAPHER IN ALASKA - HAPPY BIRTHDAY C-UNIT! BILLINGS MONTANA PORTRAIT PHOTOGRAPHER IN ALASKA - HAPPY BIRTHDAY C-UNIT! Happy birthday to my little cousin Christopher! We just got back from an epic road trip from Billings MT to Alaska. I jokingly refer to him as my little cousin because he’s younger and used to be smaller than me, but he’s a beast and has been about 5 inches taller than me since college. He was a big 50 Cent fan in high school and had the license plate C-UNIT in reference to 50’s G-UNIT. My dad has called him C-Unit ever since, so it’s kind of a nickname now! Ha! Chris did almost all of the driving on our huge road trip to Alaska and he really assisted me a lot in making some awesome landscape and nature photos. He caught me taking trying to make portraits of him every now and then, and he went along with it. 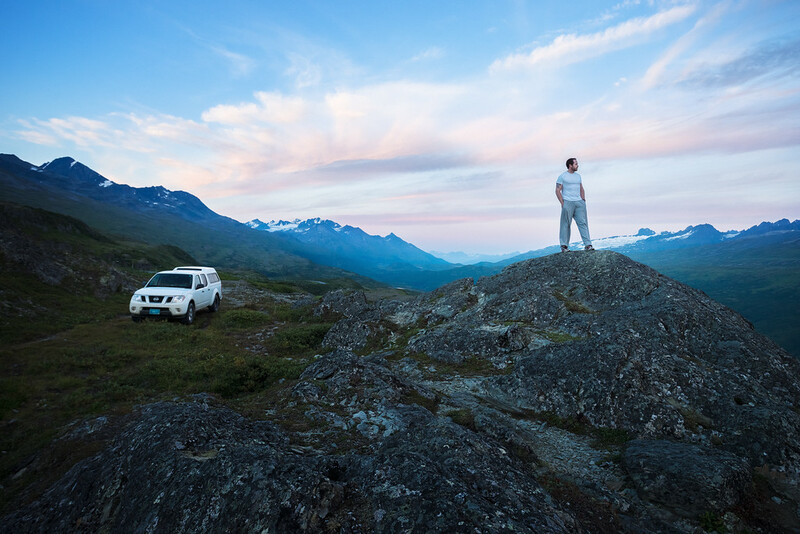 We took my Nissan Frontier and slept in the back each night at an amazing location like this spot on Thompson Pass just North of Valdez Alaska. It required some pretty sweet driving to reach this spot and Chris did it without getting a flat tire. Thanks for everything Chris, that was a once in a lifetime trip and we totally dominated it! Tips for photographers: Throughout the trip we were joking that our trip should be sponsored by Nissan because we were putting this truck through long grueling stretches of miles, really rough road conditions, and into some of the most beautiful settings you can imagine. The truck was our home, we slept in the bed of the truck under the topper each night and thanks to the extended bed on the truck it was perfectly comfortable and made us feel safer about being in remote locations with bears. But if we really had a Nissan sponsorship and support, we could have put the truck in much more precarious positions and even more epic photos. But since I rely on the truck for my photography business, I couldn’t risk it most of the time. In this photo I would have liked to have the truck up a little further but there were really jagged rocks everywhere I didn’t want to risk a flat tire, which would have been difficult to change on the rocks. It was an awesome place to sleep for the night though, and the truck handled everything we threw at it on this trip. More photos and tips about shooting in Alaska soon.